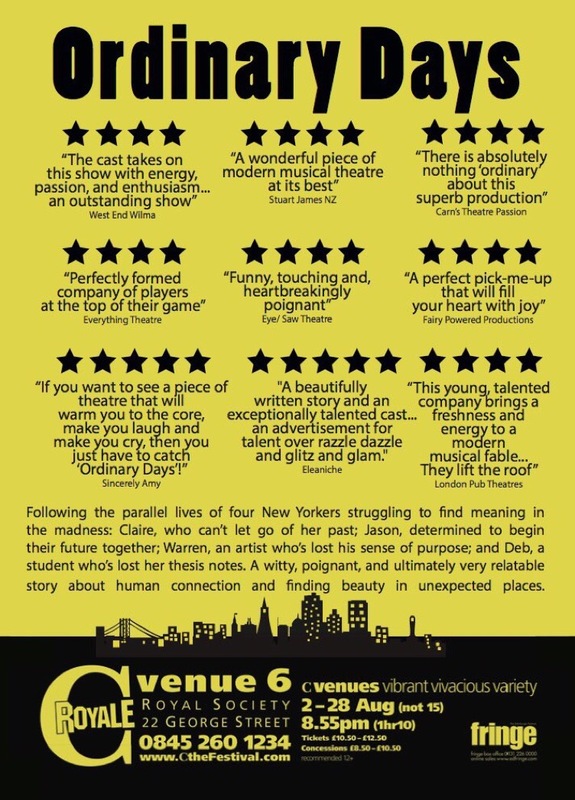 This musical follows the lives of four New Yorkers played by Neil Cameron, Nora Perone, Alistair Frederick and Kirby Hughes. All of the cast were hugely talented and completely committed to the characters and plot despite the very small venue and lack of props. I loved the storyline between Jason and Claire. Both actors who played these characters (Frederick and Hughes) were highly talented and completely embodied the characters. I really felt for both characters and found myself willing them to get together by the end of the show. The emotion conveyed by both actors was realistic and drew the audience in. Deb, a uni student, added the comical factor and again the characterisation was great for this character (Perone). Warren, who in the end became the link between all four characters, started off slightly weak with a few slightly questionable notes and pitching problems but definitely improved as the show went on and I liked how Cameron showed the emotion of the character. All the songs were very well performed and the keyboard player was amazing. It sounded like there were a few influences from Jason Robert Brown and Jonathon Larson and it was a very well thought through musical. I’d definitely recommend this musical and can see why it’s been shortlisted for Best Musical in Ed Fringe 2017. It’s talented, committed cast really tell the story well and I thoroughly enjoyed the show. Ordinary Days is playing at C Royale Studio 1 until 28th August 2017.